COBÁ, Q. Roo — These days, you can no longer trace the steps of the ancient Greeks inside the Parthenon, clamber on the mammoth slabs of Stonehenge (except for two days a year) or enter France’s Lascaux Caves to marvel at prehistoric art. All are victims of their own success—visitors are prohibited because traffic volumes threaten their continued existence. Scrambling up the 42-metre Nohoch Mol pyramid is not for the faint of heart. The steps are steep and uneven. They can be slippery, even when grabbing onto the fixed safety rope that extends from the bottom to the top. The decline is particularly tricky, and many visitors resort to going down the steps, crab-like, on their bottoms. At the top, where animals were once sacrificed to the gods, intrepid climbers are rewarded with a spectacular view of the jungle that surrounds the site and the nearby lakes from which Cobá takes its name. You can also see other ruins peeking up above the trees and undergrowth, remnants of this former commercial hub whose estimated 6,500 structures cover about mostly still unexcavated 70 square kilometres. Cobá is about a 45-minute easy drive from the popular beach resort town of Tulum, a port that served the former jungle city. Tulum’s ruins and Chichén Itzá, some 300 kilometres inland from Cobá, are far more popular tourist attractions than Cobá, which has been open to the public only since 1983 and remains less than five per cent uncovered. But the good news is that Cobá is not nearly as crowded as the other two. Visitors should have comfortable walking shoes, as the site is vast. Indeed, Nohoch Mol is three kilometres from the entrance, about a 35-minute walk. But you can rent a bicycle near the entrance and cycle there or hire a pedicab driver to transport you. For those who walk to Nohoch Mol and want to avoid the return trip by foot, pedicabs await you at the structure’s base. En route to the pyramid, there are numerous other ruins worth a close look such as stelae, ancient bulletin board stone monuments featuring the Mayans’ unique form of hieroglyphics. They reveal much about Mayan civilization and the governance of Cobá, which apparently had more female than male rulers. The Mayans were very sophisticated in other ways. Among their achievements, they invented zero (around the same time, about 5 A.D., as the Babylonians) and developed one of the world’s most accurate calendars that calculated exactly every solar and lunar eclipse through 2012. So far, archeologists at Cobá have also found five Pok-a-Tok playing fields, a seemingly impossible game whose object was to propel a four-pound solid rubber ball through a small decorative stone ring affixed to a wall more than six metres above ground. Pok-a-Tok rules are even more restrictive than soccer’s. Neither feet nor hands can propel the ball; only elbows, knees or hips are allowed. 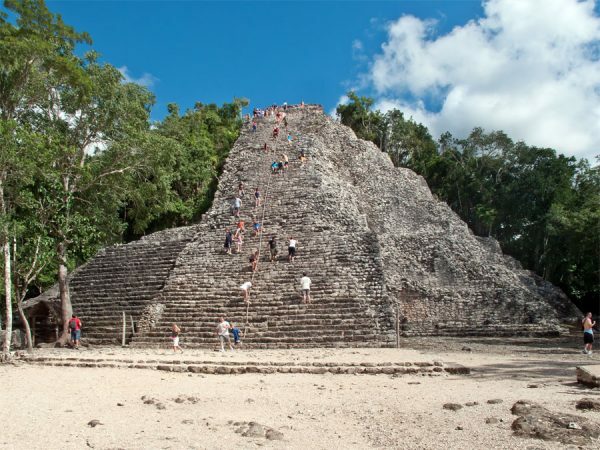 Nearly 50 roads that have withstood the test of time have been discovered at Cobá. One of them linked to Tulum, 50 kilometres away, while the longest, more than 100 kilometres, goes toward Chichén Itzá. At one point, four roads come together in an ancient four-way stop marked by a domed observatory where the ancients studied the moon and stars. The observatory is in the shape of cacao bean. “That symbolizes wealth,” says Bautista, a Mayan-speaking local who collected firewood among the ruins as a child before Cobá became a national archeological site. “It once was quite the economic power.